You are looking to treat yourself to a brand-new kitchen. A great place to start is deciding the colour scheme. The colour scheme cabinets set the tone not just for your kitchen but also for the entire home. Kitchen colour palettes are constantly evolving. It is no surprise that colours can reflect and influence our moods. 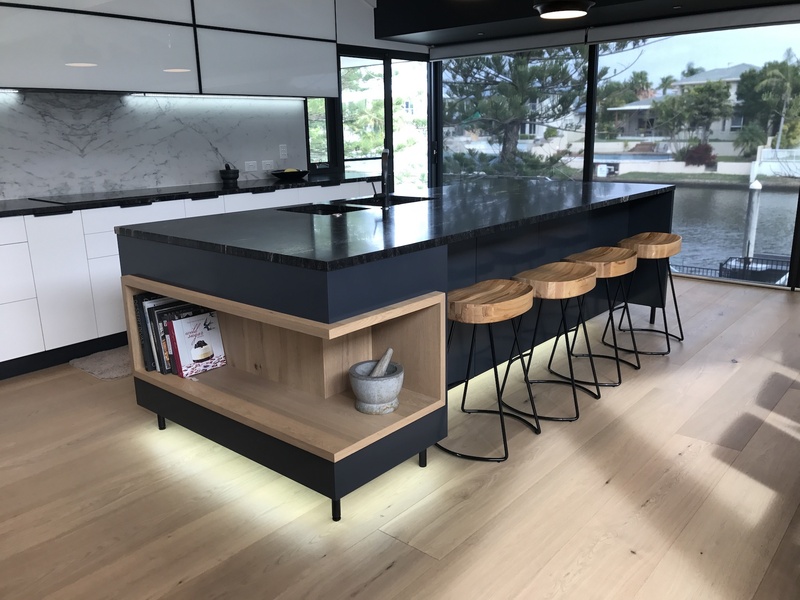 Below are explorations of up-and- coming kitchen colour palates for the Gold Coast and why they can be great additions to your home. • Ultra Violet – Pantone Colour Institute has made their choice for colour of the Year. It is a deep purple shade called ultra violet. The reason for the pick is because of its originality and ingenuity. It is a fascinating choice for homes. Ultra violet has a lush and saturated hue allowing it to create an impact even when it is used in small doses around the house, especially the kitchen. Purple hues are soothing and give a feeling of elegance and luxury. Our Gold Coast Recommendation – You can add the perfect amount of drama to your kitchen by adding purple cabinets. Purple cabinets work perfectly in many styles of kitchen and can be paired with other neutral shades such as white or grey. A splash of vibrancy added by this colour works great with the Gold Coast vibe. • Grey – When it comes to kitchen interiors, grey has become the latest neutral shade to be heavily adopted. It brings about a level of sophistication to any kitchen. Grey has been growing in popularity due to its versatility and usefulness. When used carefully, it can create beautiful results. 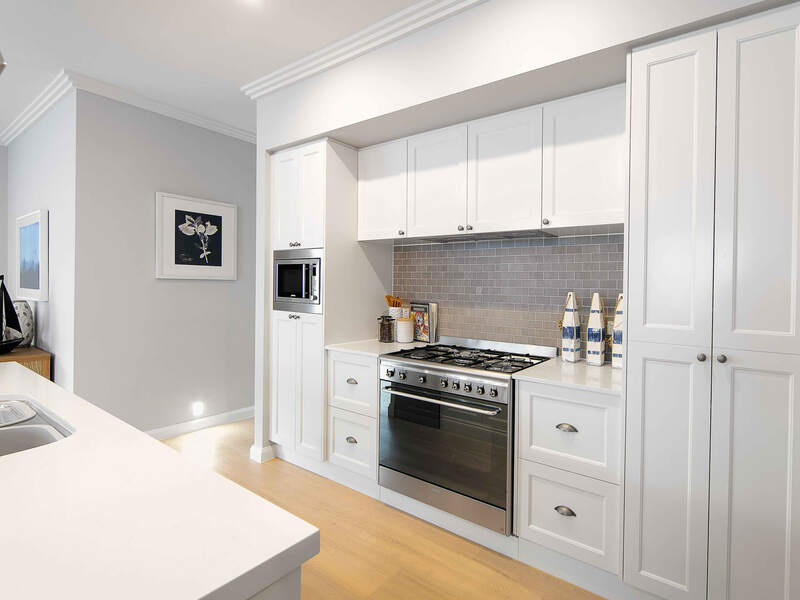 Our Gold Coast Recommendation – When using grey cabinets, you can partner it with bright accent colours for the wall to give a modern feel to it. Remember that you need to temper grey with contrast colours to temper it down. Again, this colour works great in the Gold Coast. Using grey as a neutral colour and then accenting with bright and vibrant colours to match the feel and climate of the Gold Coast. • Greige – Greige, a combination of grey and beige is another neutral shade that is growing in popularity. For most homeowners, it is a safe colour choice for kitchen cabinets. The colour is both relaxing and sophisticated. It is also easier to be combined with other shades to balance warmth. 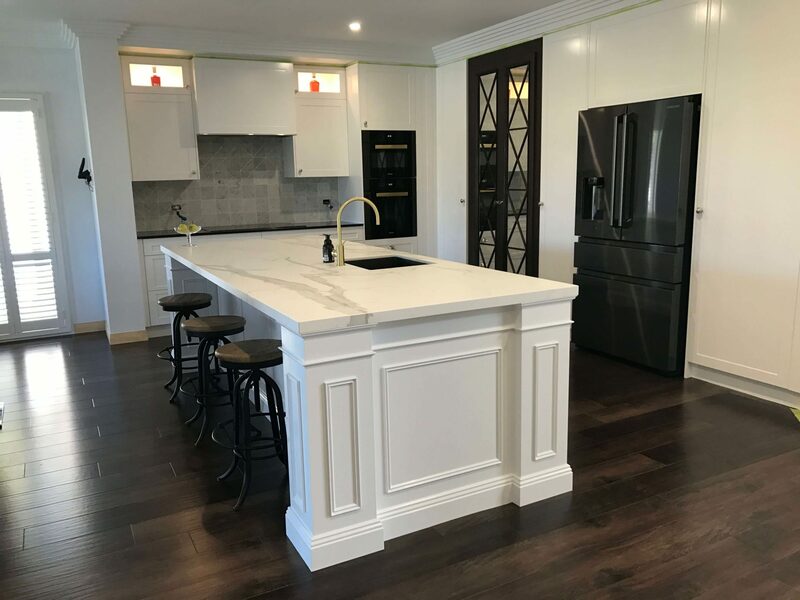 Our Gold Coast Recommendation – Greige cabinets can be paired with marble countertops and brass fixtures for the perfect kitchen look. 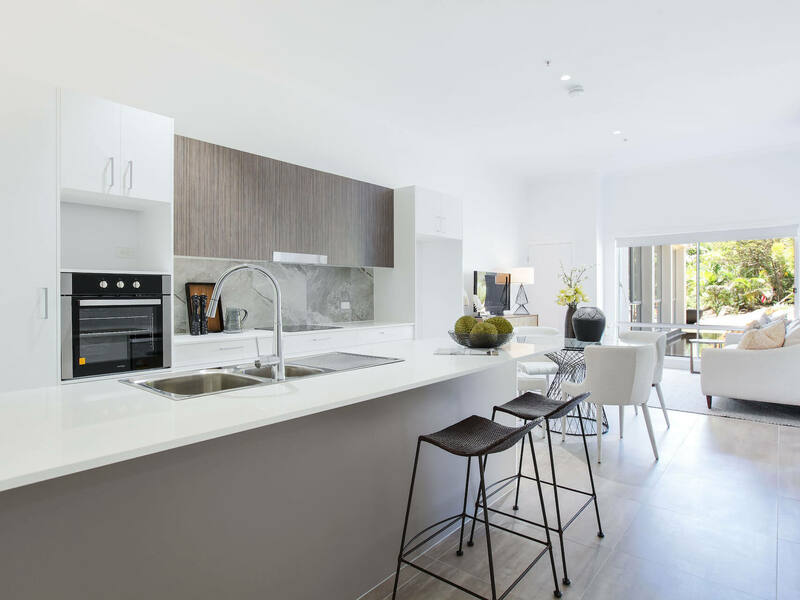 It is best used in kitchens that receive a lot of natural light, making it perfect for many Gold Coast homes. • Navy Blue – Even though many may consider navy blue as an unexpected choice of colour for kitchen cabinets. It creates a colourful presence without making the kitchen dull or overwhelmed with colours. Our Gold Coast Recommendation – Navy blue kitchen cabinets can work for any style of kitchen. Even though it is not as flexible as white or grey, it will work well with most other colour schemes. You can use navy blue for the entire cabinetry or just the main cabinetry to make a classy statement. The nautical theme associated with navy works well to complement beach homes across the Gold Coast. • Petrol Green – Petrol green is another bold colour for cabinets that is making waves in 2018. Inspired by nature, petrol green coloured cabinets will help bring a refreshing feel to your kitchen. Along with petrol green, some other shades of green that are also going mainstream are sage green, moss green, and hunter green. Our Gold Coast Recommendation – Petrol green cabinets work well with white countertops, stainless steel appliances, and grey accents. 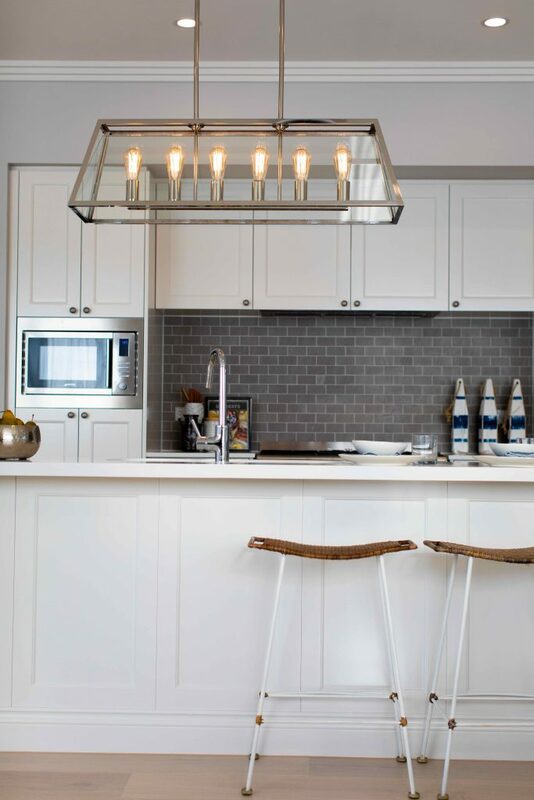 Make sure that your kitchen gets a lot of natural lights to avoid the feeling of the colour looking too dark. This colour mirrors a lot of the natural vegetation on the Gold Coast. This helps to bring an organic feeling to your home. It is essential that you pick a shade that you will not get tired of seeing every day. If you are not sure if you’ll still love a colour after a few days, you can try it out with the inside of your cabinet first for a few days. Colours are varied and unique, so have fun when picking the right colour or a combination of two colours for your kitchen cabinets. Contact us at BJF Joinery the Kitchen specialists or visit our showroom to see how we can spice up your kitchen.